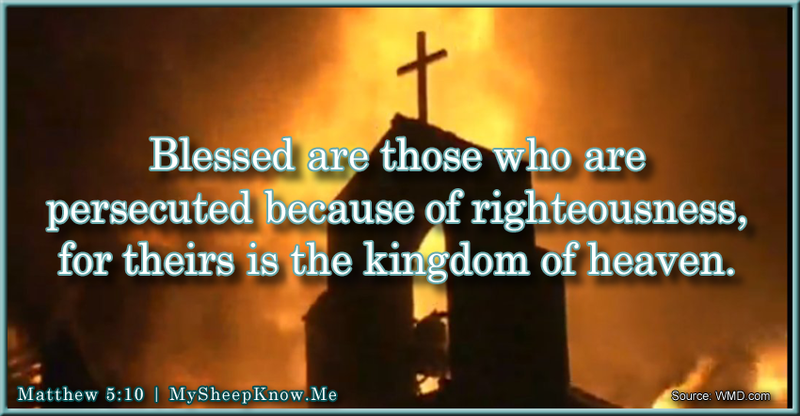 Blessed are you when people insult you, persecute you and falsely say all kinds of evil against you because of me. Rejoice and be glad, because great is your reward in heaven, for in the same way they persecuted the prophets who were before you (Matthew 5:11-12). When we are persecuted as believers, it can be something as minor as someone being nasty to us on Facebook in response to something we shared within our beliefs, or having our name falsely insulted in some way to cause us harm, or something as major as the young man who singled out Christians at a community college in Oregon saying, “If you’re a Christian, stand up. Good, you are going to see God in just about one second,” and then shooting them. God promises to give those who are persecuted a special blessing and reward when we meet him in heaven. This type of persecution is nothing new; we share the burden of knowing the truth with the prophets who spoke God’s messages to his people and in the suffering of Jesus’ unjust persecution and death. Not only should we say “thank you” to those who persecute us, for the extra blessing we will receive from God, but we are to love them as God loves them, and we are to pray for them. God sends his blessings (“rain”) even to those who are evil to him, because he loves them and sees the bigger picture. Maybe they will turn around one day remembering how you behaved towards them even when they were being evil towards you. And for doing this, we will receive a reward from God and he will claim us as his children when we meet him in heaven. But I tell you, love your enemies and pray for those who persecute you, that you may be children of your Father in heaven. He causes his sun to rise on the evil and the good, and sends rain on the righteous and the unrighteous. If you love those who love you, what reward will you get? (Matthew 5:44-46). You will be hated by everyone because of me, but the one who stands firm to the end will be saved. When you are persecuted in one place, flee to another (Matthew 10:22-23). Well that’s nice to know in advance that you will be hated for what you are sharing with people, right? The way that they were able to withstand the assault of anger and threats of violence that would take place is because they, and we, are promised to not have to face it alone. Even though the disciples were initially sent specifically into Israel and not to the Gentiles to share God’s message, in the end it was because of one man, Saul – who first persecuted and murdered the Jewish Christians of his day, and who later experienced a spiritual conversion and renamed Paul – it was and is still today the Gentiles who have benefitted most from Jesus’ death and resurrection. This is because the Gentiles didn’t have the long history that the Jews did of having received God’s law through Moses and then experiencing the ruling parties of the day, the Sanhedrin, making thousands of interpretations of that law and demanding that people live by them as the way to get to heaven. The Sanhedrin burdened and hindered the Jewish people so they didn’t understand the spirit of the law. [Jesus said] and you experts in the law, woe to you, because you load people down with burdens they can hardly carry, and you yourselves will not lift one finger to help them. Woe to you experts in the law, because you have taken away the key to knowledge. You yourselves have not entered, and you have hindered those who were entering (Luke 11:46,52). [Jesus said] the Gentiles, who did not pursue righteousness, have obtained it, a righteousness that is by faith; but the people of Israel, who pursued the law as the way of righteousness, have not attained their goal. Why not? Because they pursued it not by faith but as if it were by works. They stumbled over the stumbling stone. As it is written [by the prophet Isaiah]: See, [God] lays in [Jerusalem] a stone that causes people to stumble and a rock that makes them fall, and the one who believes in [Jesus] will never be put to shame (Romans 9:30-33). Jesus is not only the “stumbling stone” to many people not getting into heaven, he is also called the “cornerstone” that God laid in Jerusalem. In ancient building practices, the cornerstone was the largest and most solid stone placed at the corner of the building so that it would be strong and not fall, like us in our lives when we have faith. Through [Jesus] both [Jews and Gentiles] have access to [God] by one Spirit. Consequently, you are no longer foreigners and strangers, but fellow citizens with God’s people and also members of his household, built on the foundation of the apostles and prophets, with Christ Jesus himself as the chief cornerstone. In him the whole building is joined together and rises to become a holy temple in the Lord. And in him you too are being built together to become a dwelling in which God lives by his Spirit (Ephesians 2:18-22).